Plain Two Tone Wedding Ring : LOVE2HAVE in the UK! 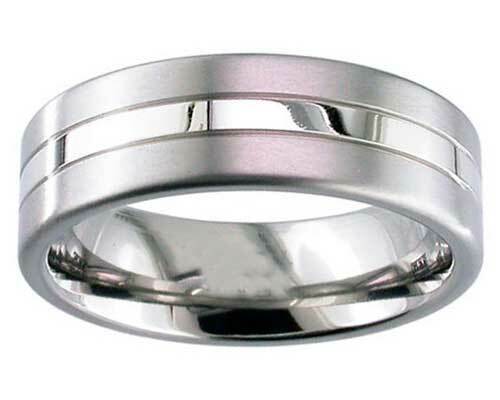 A flat profile plain wedding ring made from titanium with two grooves that sit either side of a polished central band and finished in a satin finish around this. The polished area is about 2mm wide which gives the finishing its distinct two-tone appearance and the grooves add that extra attention to detail in that the central stripe appears to look like an inlay. Various widths are also available too including narrower so, please contact us for further details if you are interested in this option.